Police are appealing for the public to be on their guard from bogus workmen following two recent incidents in the North East. Officers are investigating after two pensioners were targeted by males in the past week offering to carry out work in their gardens. A female in her 80s was approached at her home in Aberdeen on Friday May 27, 2016 where she handed over a four-figure sum of money. The males left the scene and have failed to carry out any work. On Tuesday (May 31) a male in his 70s was also approached at his home in the Turriff area by three males. The gentleman provided the men with a four-figure sum of money, however they also fled the scene. Officers investigating believe the incidents could be linked, and are appealing for anyone with information to come forward. A white pickup-type van with green writing was involved in both. These are appalling incidents which have had a major financial impact on the victims involved. We are following positive lines of enquiry in relation to both incidents, however I would urge anyone with any knowledge of a vehicle fitting this description – or anyone who has seen a similar vehicle in their area – to contact police urgently. Likewise if anyone thinks that they or their family or friends have been approached by males of a similar description offering to carry out work, you may have vital information which could help. Finally, I would urge anyone who has close contact with potential victims – older relatives, friends and neighbours – to watch out for suspicious callers or people at their doors. Doorstep crime affects some of the most vulnerable members of our society, with perpetrators often targeting victims due to their age. People have the right to feel safe in their own homes, and I can’t stress enough that bogus callers and doorstep criminals will not be tolerated. Anyone with information, or anyone with any concerns about doorstep crime, should contact Police on 101 or Crimestoppers on 0800 555111. It is not always obvious who bogus callers are, so please help your vulnerable neighbours, family or friends. 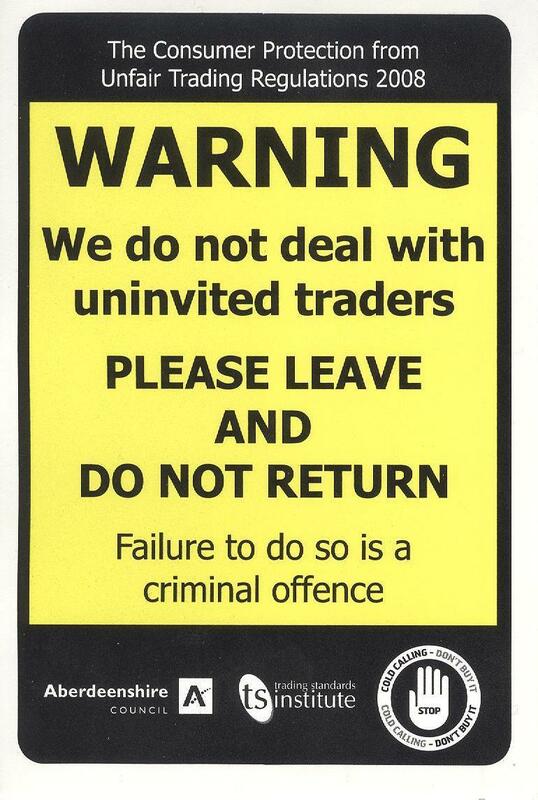 Aberdeenshire Council Trading Standards have produced a sticker that can be displayed on or near your front door. You can right click and Save As on the image below to print a copy off at home.